this famous tarot symbol represents the solar aspect of creation. it is not surprising that the Star was anthropomorphized with human like qualities. I described the concept of countenance of the Sun Card. yet we see a human face throughout various cultures. in this way we may relate to it. giving light and warmth to all. and those who acknowledge the Sun God of Old. This rendering of the Sun gently smiles upon us from beyond our reach. ringed together to complete the Amulet. 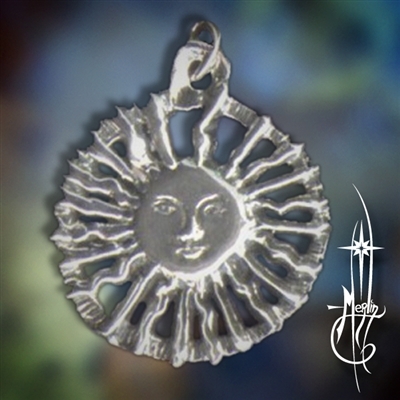 To get yours, please visit my Little Sun Amulet page. More Celestial jewelry may be found here. 00 The Fool Amulet – A fresh start, new beginnings, gift for baby or Youth who has come into his/her own. Newlyweds or some one who has decided to re-start their lives. Children and young people who have graduated, adolescents who have reached the threshold of adulthood..
01 The Magi Amulet – For focus and concentration. Good for student or scalar. Strengthens resolve in marinating concentration on projects and seeing them to their conclusion. 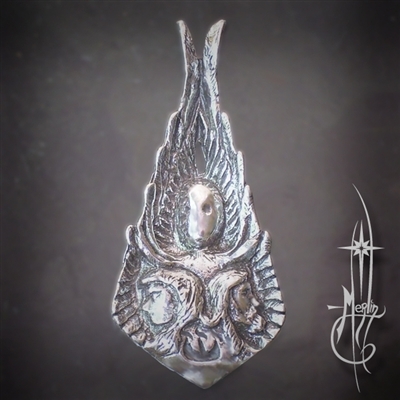 02 High Priestess Amulet – Memory both one’s own and of the Greater Unconsciousness. Aide in strengthening memory. Also good fore devotees of the Feminine both socially and spiritually. 03 The Empress Amulet – Fertility excellent in the beginning processes of projects, starting a business, starting a family, nurturing investments. The Empress Amulet is perfect for the Artist, Team leader, Executive, anyone whose task it is to Manifest the Vision. It is also for the Environmentalist: the symbol of Gaia, all things natural to the formation of Life on the Earth is symbolized by the Empress Amulet. 04 The Emperor Amulet – Vision –The Emperor represents both the perception of the world and the manipulation of it through precise control. More than an amulet of influence, it is one of perception so that one would know the right response to in a give situation. Process, Procedure and Ritual. This is an amulet for Clergy, C.E O., President, or chairman, Fathers or anyone with Duties and Responsibilities of others under their care. 05 Hierophant Amulet – Authority – Aide in keeping your feet on the ground with poise when trouble brews. The Hierophant Amulet is one for teachers, nurses, healers of all kinds, clergy and any one who has chosen the path to serve the community through Teaching, Healing and Service. 06 The Lovers Amulet – Dynamic balance of opposites – Communication – The Lovers Amulet is for Fathers and Mothers, Siblings, Special Friends, Husbands and Wives, Sweethearts and Grandparents for people that are working toward inner balance, anyone who wants to offer Love to others. 07 The Chariot Amulet – Protection, shields, sacred ground – is for those who create and maintain Sacred Space, whether it is a lawyer working with contracts, Clergy that would be performing Marriages, someone who creates and maintains sanctuaries, alters, courtrooms, homes and gardens. It is for Healers and other body workers, marinating the Temple of the Body, Guardians and Keepers of the Peace, the Home Guard. The Chariot Amulet represents Health, Honor, Protection and Virtue. 08 Strength Amulet – Inner strength – Self control and discipline, focused Will -Individuals who are studding Kundalini, Yoga, martial arts, warriors, firefighters and other people whose life is demanding Inner Strength would find appreciate the Strength Amulet. 09 the Hermit Amulet – Purity, Truth, Development- The Hermit Amulet would be appropriate for those that are self starters, innovators, those that serve humanity because of their own convictions rather than because they are told to do so. A Hermit need not be one who lives off in the wilderness but one who is at peace in a crowd and in solitude alike. The Hermit Amulet is also one that is intended to stabilize one’s journey in life and remind them to hearken to their own inner voice rather than to follow a leader, group of movement: to walk the path of Virtue. 10 the Wheel of Fortune Amulet – the Law, Rhythm, The patterns of the seasons, Centering- The Wheel of Fortune Amulet would be a good tool for one who has lost direction and feels jumbled in life. The Amulet would assist in centering one’s self and others: a team leader, someone who is in combat or in an ER; Centering and stabilizing one self, one’s family, community and world. 11 Justice Amulet – Natural Balance, Maya and Karma – The Justice Amulet would be good for those who are dedicated to the Law: Judges, Lawyers, social workers. The Amulet would also be good for those people that are in charge of clearing spaces: Housekeepers, Maids, folks that work a Kitchen, police or security officers or in any way in charge of keeping spaces clean and clear of unwanted objects, clutter or energy of any kind. 12 The Hanged Man Amulet – Suspension, sacrifice, Turning the mundane to the arcane – The Hanged Man Amulet is for any one who wishes to harness daily activates would normally be considered physical into acts of Spirit. From Homemakers to Clergy, Nurses, massage therapists, interior designers and gardeners. Those dedicated to social work, volunteers both in the public eye and those who perform acts of charity without the need of payment or fanfare. In other words, just about everybody. 13 Death Amulet – The threshold – death/re-birth, the bardo – The Death Amulet would be for those in a powerful transition: a lad who has “become a Man”, a girl’s transition into Womanhood. One who suffered a major loss and re-forming their lives would find this piece useful: embrace the break in the pattern and start anew. Like a tonic, the Death Amulet is for a short yet important periods in one’s life. 14 Temperance Amulet – Art, purpose, Creation – The Temperance Amulet is for the Artist, Actor, Musician or Dancer. The filmmaker that can inspire and inform their audience. The Temperance Amulet would be for those that are more subtle in their abilities to express themselves for the benefit of those around them: home makers that can turn their dwellings into places of inspiration; a chef that can create food, helping one transcend their daily routine. It is within the context of Temperance that we gain a better understanding of the Art of Living. 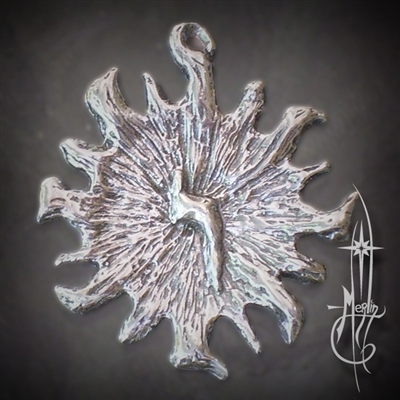 15 The Devil Amulet –Humor, satire, the power of fiction – This amulet would be an amulet for writers, comics, filmmakers, anyone who creates fiction, images or media that can inspire, reveal the truth or test one’s metal. This is for the trickster, the joker or the teller of tales. It is an amulet representing Humor, the telling of stories and the practical joker. It is also for the scientist: one who tests theories, weighs ideas for their merit. It is for the Editor, one who looks to stories and weighs the validity of their meaning and truth. 16 The Tower Amulet – the destruction of falsehood, Truth reviled – There are those whose jobs it is to give us the necessary jolt of reality: Judges, Police Officers, Solders and Oracles. However, the Tower Amulet is more of a tonic rather than an every day piece. If you are in confusion, unable to decide what to do, if you feel like you have been lied to and wish to know the truth, then the Tower would be a good tool in meditation. This would be ideal to keep on hand for a spiritual councilor, to use for short periods of time and then to be put aside to build again. 17 The Star Amulet – meditation, experimentation, discovery through self reflection – The Star Amulet would be excellent for those that have decided to use meditation as a practice on their lives. This tranquil amulet may be used to calm and clarify one’s perspective and achieve a better understanding of themselves and their environment. Practitioners of Yoga and martial arts, Religious practitioners who use Meditation and Prayer would find this amulet helpful in their daily lives. 18 The Moon Amulet – Dream experience, the spiritual path, development through maintaining balance – The Moon Amulet is for those that have realized their Life’s Path and have committed themselves to walk their talk. Although not an advertisement for being a Spiritual Leader, one teaches by example, treats others with the respect due them and learns from children as well as their Elders of community. This is a good amulet for councilors, advisers, leaders and solitaries. 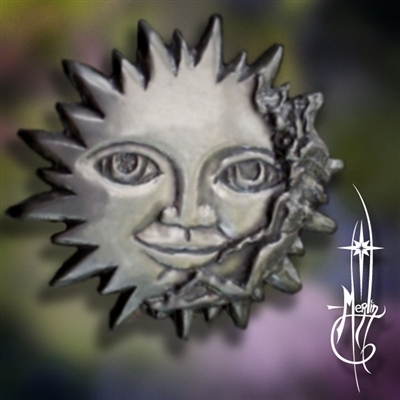 19 The Sun Amulet – Masks, filters, seeking the truth through discovery of the universe – The Sun Amulet may be used as a constant reminder and dedication to the Divine. It can also be a reminder not to take things at face value, that there are always layers of assumption between us, no matter how close we are to others. This amulet would be good for Actors, representatives, politicians, teachers and others that interface with the public. 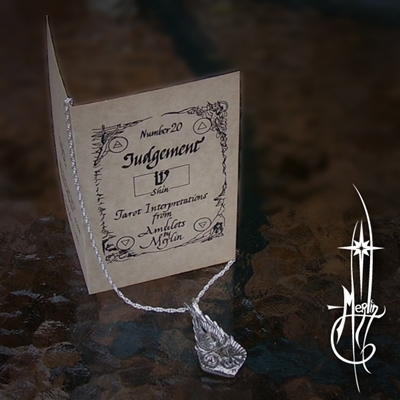 20 The Judgment Amulet – Perpetual fire consuming the unneeded, lessons through hardship, the amalgamation of the personalities – People that would find this amulet useful in daily life would be Judges, arbitrators, housekeepers, and maintenance crews, gardeners, any whose task it is to clear, cleanse and renew environments, relationships and patterns of behavior. 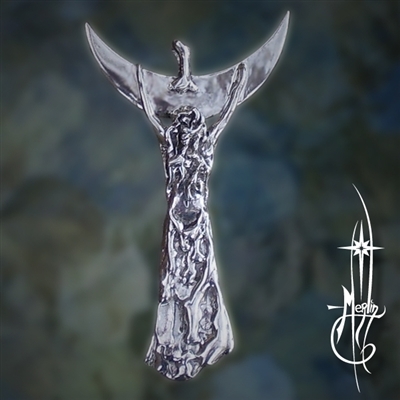 The Judgment Amulet is a potent symbol of Spiritual purification. It may be worn by those that are going through upheaval in their lives, watching their positions being discarded, acquaintances being revealed as unhealthy and discarded; all this and keeping balance, knowing that this period on one’s life is to be harnessed as a positive and necessary thing. 21 The Universe Amulet – The ever expanding entirety of knowledge and experience, discovering the infinite through limitation – The Universe Amulet is for those that are explorers, scholars, students, those who have taken on the quest of Life: ever searching for meaning, the source, and themselves. The Universe Amulet is for musicians, dancers, lovers of music and the arts; those that push the envelope and are unafraid of new experiences, new ideas and a larger Universe. Emotional turmoil, unneeded angst, prejudice, hate, fear, grudges and so on.